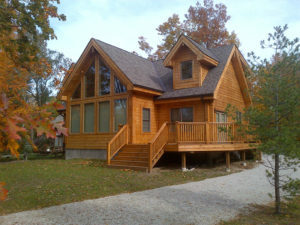 Footprint Log Homes is comprised of a group of highly experienced professionals, who have valuable experience in the log home industry. At Footprint we are committed to going the ‘extra mile’ for our customers. You have our assurance that we will work with you to make your custom dream home a reality. By carefully listening to your ideas and blending them with those of the design team, together, we will create the custom home that perfectly reflects your individual life style. The team at Footprint Log Homes not only designs and engineers your home to meet your aesthetic and practical needs, but also deals with site-specific issues such as seismic conditions, snow loads, wind velocity, energy requirements, local building code and much more. Footprint Log Homes commitment to you is to ensure that building your ‘dream home’ is an enjoyable and exciting experience! We look forward to guiding you throughout this entire process!